She cheated!… Yes, I know what you’re thinking. She’s only 3 years old – how could she cheat? It all began with Phonics time. This class is always filled with fun and games, saying the vowel chart, learning the names of each letter, the sounds that they make, and hearing that sound in words. Today, however, took a quick, shocking turn as AbiNoelle began shouting out the answers to Mrs. Pintar’s questions. You see, today, Mama Hen came for a visit because it was time for her eggs to hatch and she need the boys and girls to help. As Mrs. Pintar flashed the letter cards, whoever said the sound or letter name first got to go help Mama Hen hatch an egg. When the egg “hatched” and the little chick placed next to Mama Hen, Mrs. Pintar told the student that they could cheep, cheep, cheep back to their seat. 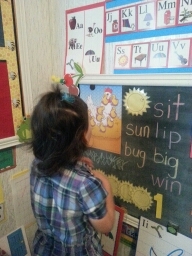 What fun we had today…calling out the letters and hatching eggs. It was after about the the third hatching incident that it happened. AbiNoelle sweetly placed the little chick beside Mama Hen and, turning around with a lot of cheep, cheep, cheep sounds, she proudly declared, “I sure did a lot of “Cheating” today! Oh, the giggles that mommy let loose! 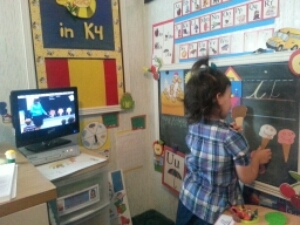 The K4 DVD program brings lots of fun and excitement to learning. From “cheating” to yummy licks from the ice cream cone, each day is filled with learning in such an enjoyable way. Not just fun and not just school work, but a nice balance. We are so thankful that school can be such a delightful experience, and, even more so, appreciate every little tidbit of learning that takes place. Just Saturday, as we rode in the car, AbiNoelle was apparently thinking about the Creation lesson with Mrs. Wasser and said to her daddy, “Did you know that God’s words are POWERFUL. He just said the words, and it happened.” How precious is the pure belief and understanding of a small child, and how special it is to witness your child not only learning the ABCs but the fundamental truths of God’s Word.